Happy Holidays: Happy Valentine's Day To You! I haven't had all of my Valentine's collection out in a very long time, we don't have the room to display it all. Since we have stopped using our fireplace, it was too dusty and smelly, I now have an area that I can do a large display in. Here is a picture showing the full display, there are close-up shots of the items for you to look at. The box of "Kiddies Valentines Assortment" is in mint condition but minus its contents. The bust of the coy young lady was used as a boudoir doll pincushion I believe. I bought it when I was in art school a very long time ago, she seems to suit the Valentines collection. She sits, do heads sit, in front of a cloth doll dressed in red and white felt. Between the coy young lady and the two love birds florist vase is a porcelain Art Nouveau vase. The only mark on it is 7983 stamped on the back. It is standing in front of a red, white, and silver roll of Valentines garland made by Biestle. In front of the chocolate box there are two different size glass tumblers with the same design, a raspberry pink celluloid doll standing beside a vintage florist vase, an old metal cookie cutter, and a pair of salt and pepper shakers that together form the shape of a heart. Up behind the heart shaped florist vase with cupid in front is a plastic fan that is resting on an old Avon Valentines soap box. The little boy holding the heart is one half of a salt and pepper shaker set, I wish that I had the other, the modelling is superb. Resting in the top of another florist vase is a sleeve of embossed paper napkins made by Perkins. These are from the 1940s, the fellow is dressed in a Zoot suit. I bought these from an old stationary store in Victoria when we were first married. In the centre of the mantle hanging below the ledge is this beautiful deeply modelled cast metal plaque. 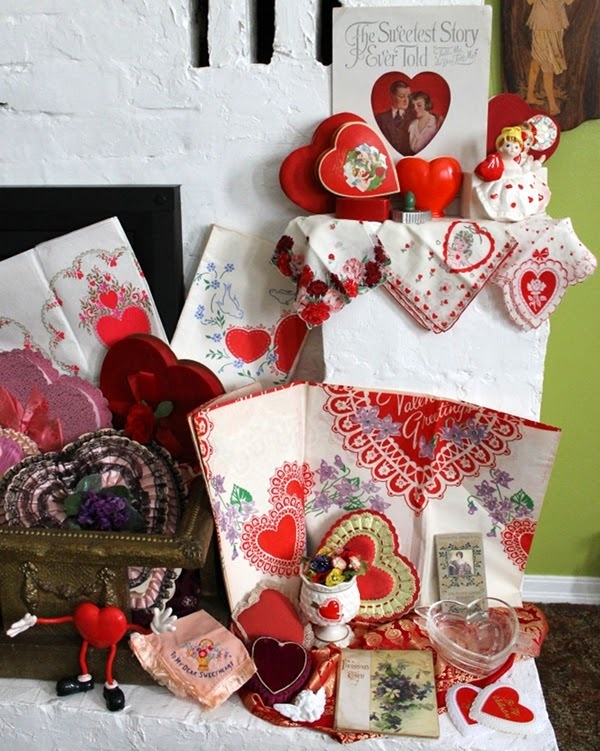 In front of the red foil chocolate box with the very deeply embossed metal decoration is a heart shaped jug and beside that a small heart pin cushion with button eyes made by a child for his, or her, Mum. On another roll of paper garlanding is a vintage book of children's paper Valentines, two floral picks and a plastic cake top decoration. In front of the other book of children's Valentines is a small vase, cupid pushing a heart in a wheel barrow. To the right of cupid and his heart is a heart shaped vase that has a small opening for flowers at the top. In front is a heart head cat playing a bass; one of a pair of salt and pepper shakers. In behind him is another fabric doll dressed to the nines in tulle and lace holding a single flower. The hammered brass fireplace surround that I use under the Christmas tree makes a great "walled garden" for the Valentine's tree with most of the heart chocolate boxes massed at the base. Tucked on the mantle ledge in behind the tree are three vintage heart shaped florist vases resting on a blue vintage head scarf covered with hearts, ribbons, and gold keys, a gift from my daughter-in-law, Nicole. In front of the white vase is a plastic decoration of two cherub heads, possibly for a cake. The base of the vase holds another vintage handkerchief in place. 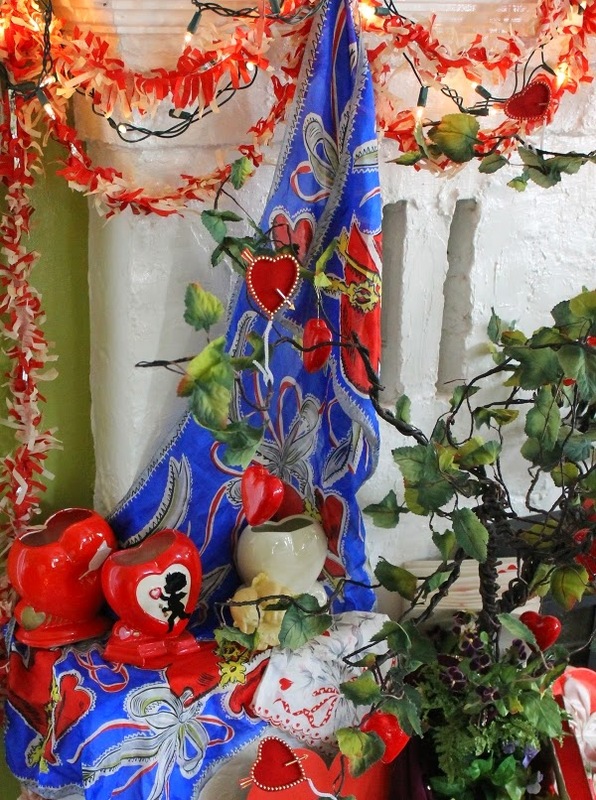 This close-up of the ledge shows more vintage hankies, florist vases, a cookie cutter and heart shaped chocolate boxes. The small red box the Valentine with the cupids is resting on is marked Shackman on the back, I discovered this the day that I was putting the display up. 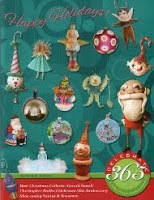 I have only recently found out about the Shackman Company, wholesalers of holiday and novelty items. I wanted to show you a view of the two little girl vases, they are the same design but the modelling and the colours are different on each one. The vase in front has a gold foil shield shape paper seal on the bottom marked, Thomas A. Ivey & Sons Port Dover. It is stamped on the bottom in black, JAPAN; there are also mould impressions on the bottom that look to read, Relpo and below that 6657. This vase may be from 1957and be the earlier of the two. The other vase has a gold foil paper seal printed with, Relpo Chicago Illinois Made in Japan and stamped in black, A-1986 JAPAN. 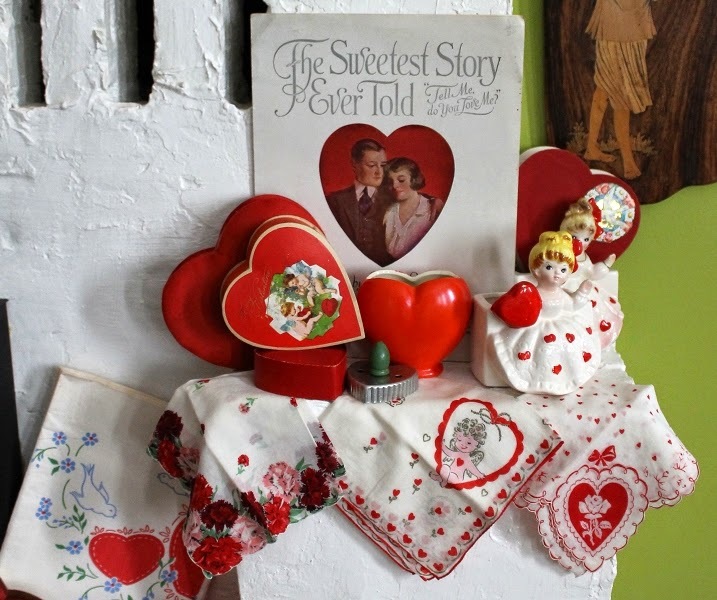 The paper tablecloth coth is my favourite of the ones that I own, it has lots of great Valentines images on it. 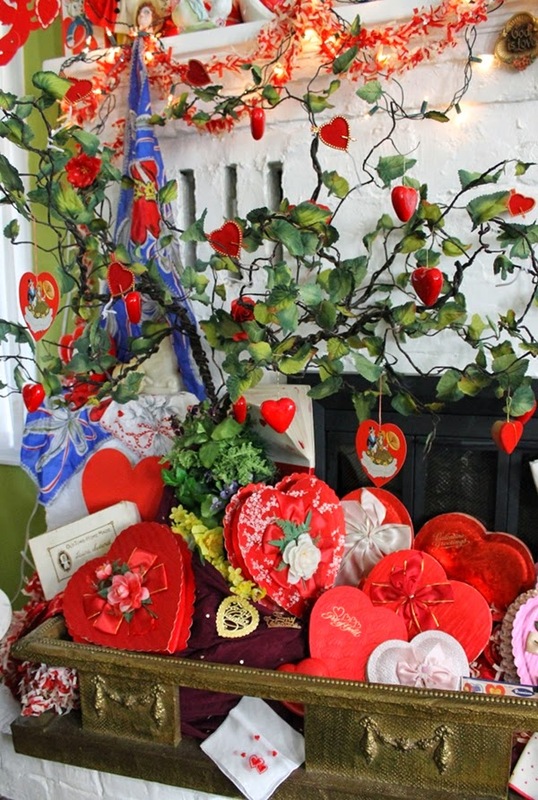 Just in behind the small deep red heart shaped box is a dull red fabric heart with lace around the outside. I made that heart shaped pin cushion in grade four or five I believe for my Mum for Valentine's Day. The two clear glass dishes have hearts and cupids in relief around the outside edge of the dish. There is the head of an arrow on the upper left hand side of the dish with the tail of the arrow on the lower right hand side. The bottom is marked, SAFE BAKE U.S.A. The "walled garden is filled with vintage chocolate boxes, paper tablecloth covers, two Dennison sticker books, and at the base of the tree on the purple cloth two gold foil cake or cookie decorations. On the vintage marble table beside the stuffed chair are a glass heart shaped bonbon dish with a crocheted heart topped with two plastic cupcake picks and a gold metal cupid. Behind the dish is a 1950s red foil decoration of a lady in silhouette and to the right is a sheet of Valentines die-cuts from Germany. A few days ago I came across another wooden decoration/napkin holder that had a larger base than this but I didn't buy it as I felt that this was the better of the two. Again, have a "HAPPY VALENTINE'S DAY"! Wow, Len, you have a wonderful collection! You have displayed it beautifully too. Happy Valentine's day! You have a beautiful collection. Enjoyed seeing all the photos.